The Chattahooligans are famous for our ambitious, ever-changing song list. We are simply the best in the business. But don’t be intimidated- there’s an app for that! The Chattahooligan Hymnal is our living, breathing library of songs, available both in your pocket and in your heart. We’ve also taught the app a number of handy tricks. Our song/chant writing team updates the server before every single match, so your app will always have the latest and greatest songs. This includes the infamous “Daily Diss Tracks” that we will use to torment our next opponent and “Songs of my People” to lift up the Girls and Boys in Blue and celebrate their individual contributions. We hold “choir practice” before every match. Our capos will beam the lyrics to new chants right to your phone so we can all learn together. We love CFC even though their website is not always up to date. The Chattahooligan Hymnal also contains an accurate roster, so you’ll know which of our heroes wears which number. Plus, learn the unique songs for every player. The app features quick access to our various social media accounts, ongoing charity and special projects, an event calendar, and links to the league standings. We will also occasionally post news updates directly to the home screen. Search for “Chattahooligan Hymnal” on your phone’s app store, or use the links below. It is totally free to download and use, and we don’t store or track any information about your personal identity. Looking for something a bit more tactile? We offer a printable songbook as well. 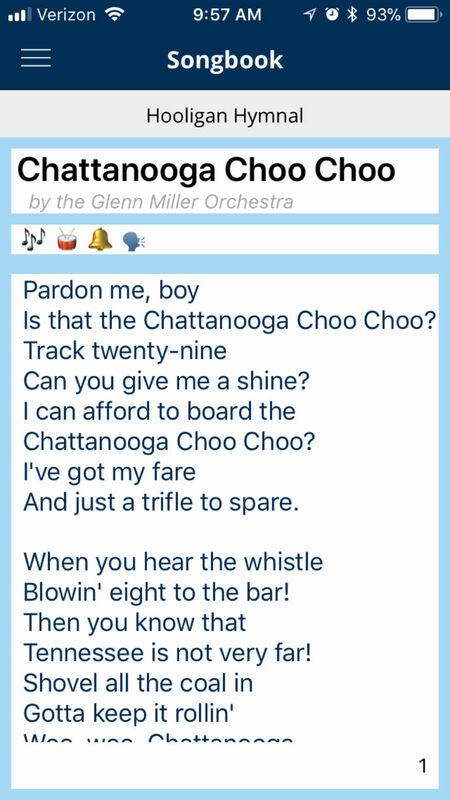 The Chattahooligan Hymnal is created by Chattahooligans, for Chattahooligans. We are looking for designers and developers (React, MongoDB) to help build out an ambitious road map of features. If you can contribute to the project, or just have feedback, please hit us up via email at thechattahooligans@gmail.com or DM @hooliganhymnal on Twitter.